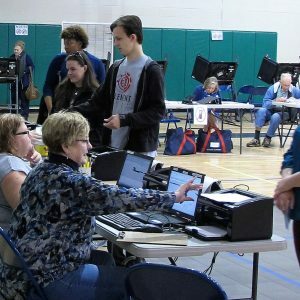 Voters turned out in large numbers across Western North Carolina to vote for federal, state and local offices. While much attention focused on the national and North Carolina races, several local races were highly competitive this election season. Apparently the closest local race in Western North Carolina was a District 2 county commission race in heavily Democratic Buncombe County that saw Republican Mike Fryar holding on to a lead of just under 300 votes over Democrat Nancy Nehls Nelson with all precincts reporting. Because that margin is less than 1 percent, final results may depend on canvassing next week and the possibility of a recount. County-by-county results for WNC local races follow. 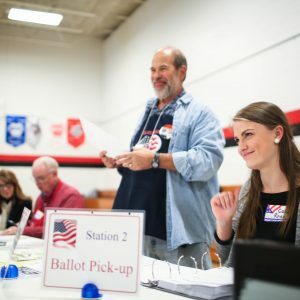 UPDATE (Nov. 18) — Due to a database question related to voter registrations at the Department of Motor Vehicles that affects most North Carolina counties, canvassing to review provisional ballots is being delayed in those counties, including Buncombe. The county election board met Friday, Nov. 18, to fulfill their statutory obligation to do so, then immediately suspended the meeting with plans to reconvene on Monday, Nov. 22. The outcome of the closely contested County Commission District 2 race will not be known for certain until at least after that meeting. If the margin between the candidates is sufficiently close after that meeting, the candidate who trails may be able to request a full recount. As far as Carolina Public Press has been able to determine, this is the only local race in Western North Carolina that remains undecided, though several close statewide races remain in doubt.